Partick Thistle boss Gary Caldwell told Sportsound that he was looking foward to a difficult replay at Tynecastle. "Overcoming Hearts at Tynecastle will be difficult," he said. "Tonight we showed our quality and our passion. It was a fantastic cup tie and we contributed a lot to that. I saw a lot of focus from my players. "The only disappointment for me was composure and not passing the ball enough. I thought set piece-wise defensively we were very good, apart from the goal, which was the one time we switched off. "They have a lot of variation in their set pieces but I thought we dealt with them extremely well. We dealt with their physicality really well and then as the game went on we started to grow into the game. "Second half I thought we were excellent, showed composure, passed the ball well. We scored a fantastic goal and thoroughly deserved the draw." Hearts boss Craig Levein told BBC Radio Scotland's Sportsound: "I think Thistle’s goal was their first on target and that tells you the story of the match. "This was always a potential banana skin coming here. Thistle showed plenty of fight in the match and all credit to them, they managed to sneak the replay. "I've had a look at the penalty claim involving Uche Ikpeazu. It's a certain penalty. Everything put together it was a frustrating time. We’re still in the cup competition and that’s the most important thing. I didn't want to go to a replay but that’s the way it goes." The semi-finals at Hampden will take place over the weekend of 13/14 April. So, one all-Premiership tie in the semi-finals with the winner of the Aberdeen/Rangers tie meeting holders Celtic. It could be an all-Championship tie in the other last-four tie if Partick Thistle win their replay against Hearts to meeting Inverness Caledonian Thistle. Next out is Aberdeen or Rangers and that means they will take on holders Celtic. And they will play Inverness Caledonian Thistle. Partick Thistle or Hearts are first out of the hat. It's time for the Scottish Cup semi-final draw, Scottish assistant coach James McFadden and Twin Atlantic singer Sam McTrusty are poised to pull the numbers out of the hat. 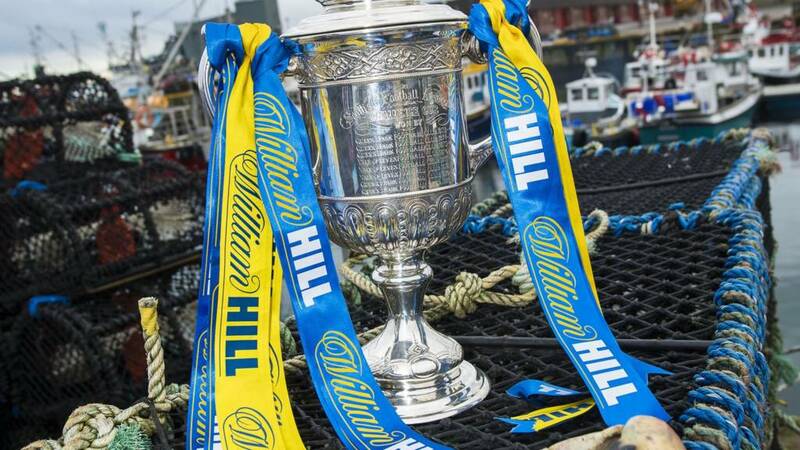 The Scottish Cup semi-final draw is coming up. Tune in to The Nine on the BBC Scotland channel above to watch it live. It's a replay at Tynecastle for these two sides after 90 minutes at Firhill fails to yield a winner. Hearts will host Partick Thistle next Tuesday, 12 March. Craig Slater's long-range shot for Thistle has power but lacks direction. Sean McGinty and Joe Cardle are booked for challenges as Hearts try to break from a Partick Thistle set piece. Three minutes of added time begin.